we remain open, persons in process. Here, McCarthy’s use of enjambment and short lines, conversational and pleasantly erudite at once, make a case for the power of insistence in the process of personal evolution. In other words, the line may be over, but the thought continues and joins other thoughts to form the building blocks of personal art. The speaker of this poetry is aware both of depletion and of the possibility that loss (of time? of energy?) is a transformative process that may create an entirely different whole. We are the sum of our present circumstances, this poetry tells us in language that is both spare and evocative. In these textured, run-on lines, the speaker both shushes and celebrates the comfortable racket of daily life, suggesting that in the dual navigation of silence and noise, of reception and creation, lies movement and thus survival. 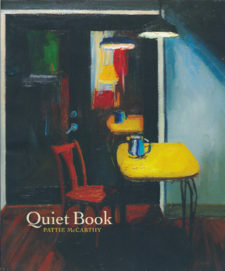 Throughout this collection, McCarthy grounds the reader in gestures of love, bemusement, adoration, and interdependence as the poet-mother tests her own boundaries and abilities and tells us, “there is always / another one to be found.” In Quiet Book, the reader finds thrust, brevity, fragmentation, and completion. This entry was posted in Uncategorized and tagged Spring 2016 on May 12, 2016 by Kelly.